The U.S. Coast Guard Sector Anchorage received a call on July 25th that a 47-year-old crewmember working aboard the F/V NORDIC CROSS had sustained a severe leg injury and needed medical attention. 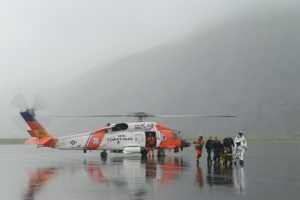 Watchstanders requested that an MH-60 Jayhawk helicopter crew be called to medevac the man from the vessel, which was located in Duck Bay, near Kodiak, Alaska. The helicopter crew hoisted the injured fisherman aboard, then transported him to awaiting emergency medical personnel. Unfortunately, leg injuries are prevalent among those who work at sea. Rocking waves combined with the following hazards can create dangerous situations when risk is not properly mitigated. Keeping workers safe should be everyone’s number one priority. The attorneys at Stacey and Jacobsen, PLLC understand how leg injuries happen and how they can be prevented. If you or someone you love has been injured while working at sea, give us a call and we can talk about your options.